Whether you need a new gutter system or leaf protection, we can help. LeafGuard by Midlands Home Solutions installs LeafGuard brand seamless gutters. LeafGuard is not an add-on cover or screen; it's a patented, one-piece, covered gutter system. The unique, seamless design keeps debris from collecting in your gutters which prevents clogs, leaks and water damage; keeps water flowing freely and eliminates gutter cleaning. As the certified LeafGuard dealer in Eastern Nebraska & Western Iowa, we're proud to install the industry's only patented one-piece covered gutter system. If you're ready to say goodbye to cleaning gutters, contact us today to request your no-obligation consultation and free estimate. 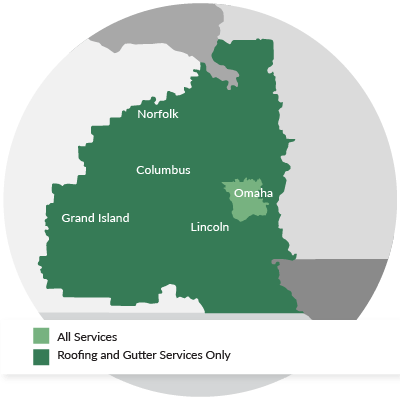 LeafGuard by Midlands Home Solutions is your trusted gutter company for quality seamless gutters and professional gutter installation in Nebraska & Iowa. We provide free estimates on all our gutter services in Sioux City, Bellevue, Grand Island, Kearney, Fremont, Hastings, La Vista and surrounding areas.